The Steel City has claimed yet another accolade to add to its growing list. USA Today recently voted Pittsburgh as the best large metro area for jobs. The rankings were based on “the number of hiring opportunities relative to population, the area’s affordability and job satisfaction,” according to Glassdoor.com, a website which allows former and current employees to anonymously review companies and their management. This is far from Pittsburgh’s first recognition as one of the best cities in the country. In 2018 alone, Pittsburgh was selected as the second most livable city in the United States, number one city for the most affordable rent, number 34 out of the top 100 places to live in the world, and number one city for young people to live based on job opportunities, affordability and livability. The fourth quarter of 2014 finished without the anticipated flourish that it was trending toward. Vacancy actually crept up three basis points from 7.2% to 7.5% while absorption for the quarter experienced a negative 591,656 square feet. This is the largest negative quarter since 2009 and all others, with the exception of the second quarter of 2014, were positive. Even with the market giving back close to 600,000 square feet in the fourth quarter and 300,000 square feet in the second quarter, the year end absorption number was still a rosy 675,000 square feet. At least a portion of the negative absorption in the fourth quarter of 2014 can be attributed to American Eagle officially bringing their 440,000 square foot distribution facility in Thorn Hill Industrial Park to market. It would be remiss not to credit a portion of the slow down to the sudden and unexpected drop in oil prices with prices under $60.00 per barrel, and for a brief time under $50.00, suddenly uncertainty spread into the previously teflon-coated energy sector. While this is anticipated to be a minor blip on the radar, it is fully expected to bleed into the first quarter of 2015, negatively impacting deal volume although not necessarily slowing advancement of projects by larger players in the sector. Deals of significance in the fourth quarter include the sale of 367 Morganza Road, a Colliers International | Pittsburgh listing, in Washington County to National Rubber. The 65,700 square foot building traded at $52.00 per square foot. Edward Marc Brands leased 50,000 square feet in the Lawrenceville section of Pittsburgh and R&N Steel Manufacturing leased 70,000 square feet at 3401 Grand Avenue on Neville Island. Evidence of the trend noted on the back page of this report, 6500 Hamilton Avenue a 60,000 square foot multistory building in the red hot east side sold for $14.00 per square foot. The new owner plans to convert the former warehouse building to a higher and better use. 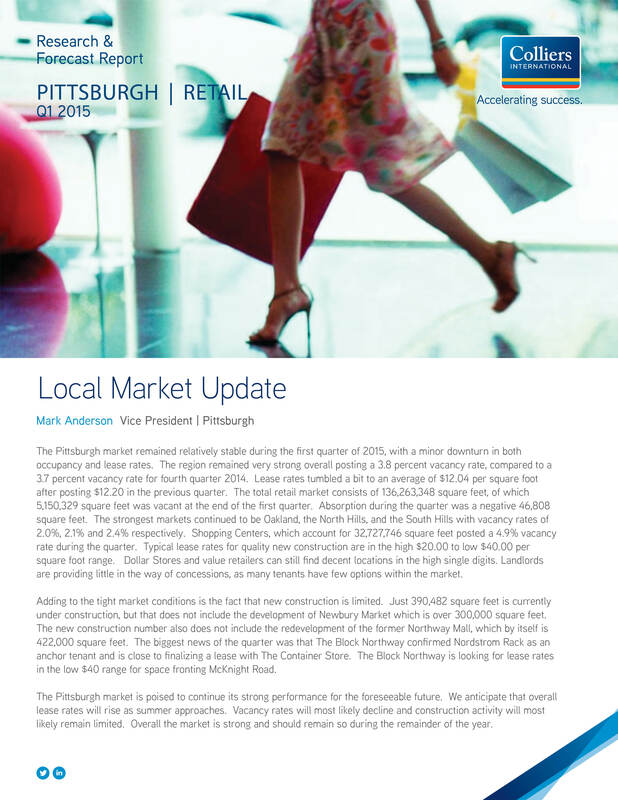 Click here to see the full Q4 2014 Pittsburgh Industrial Market Report.